Originally from Texas, Brandon graduated from the United States Military Academy in 2008 with a B.S. in Management. A four-year member of the football team, he commissioned as a Signal Officer. He was assigned to the 2nd Infantry Division in South Korea where he served as a Platoon Leader and Communications Officer. He has also served in the 11th Signal Brigade at Fort Hood, TX, including two deployments to Afghanistan, as an Executive Officer, Logistics Officer and Company Commander. 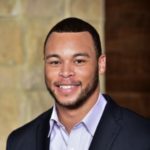 Brandon is a member of the class of 2018 at the University of California at Berkeley Haas School of Business. He is passionate about educating veterans on the power of graduate and post-graduate studies, moreover aiding veterans in the transition process from service to school.